Discussion in 'Game Design, Development And Publishing' started by JeffJ, Jan 29, 2019. I'm thinking about the best way to handle going up and down stairs between floors in a platformer / side view game in the most intuitive and "smooth" way that is both user friendly and feels good and natural. Not in terms of collisions or anything like that, but strictly in terms of game design. Here's a quick graphical illustration of my thoughts so far, and the three different solutions I have considered. I couldn't find a sideview game that handles this, or any discussions on the matter, so I would love some input, and maybe even an idea that I hadn't even considered. I think the user experience would lean me towards option C, as you have a clear visual clue of wether you can walk on the trap or go down stairs. It would be a simple case of switching a state_open in the trap object, plus it looks like it can lead to some cool mechanics, like keys to open traps, acces to new/secret areas, etc, which option A doesn't offer. Option B seems confusing and doesn't leans toward the key things neither. I'm honestly leaning towards option C myself. One concern I have though, is that it's potentially confusing to the player, since the trapdoor's rules are inherently inconsistent; if the player tries to pass through it when moving up the stairs (and it's closed), they'll bump into it and learn that it is solid. When it's been opened (for example via the use of a typical "Activate" button), what's to lead the player to believe that anything has changed in terms of the solid rule? If they believe it's still solid, they might automatically gravitate towards option A instead from where they stand. I fear that it's an option that can potentially confuse. You could also try to remedy this be making it slightly transparent when open and fully opaque when closed, but that might clash with the aesthetics. I'm not really at all concerned about how to code it; my main concern is how to communicate it as intuitively and efficiently to the player. Hence the thoughts I shared in my previous post. I guess it also depends on the rest of the game mechanics too. 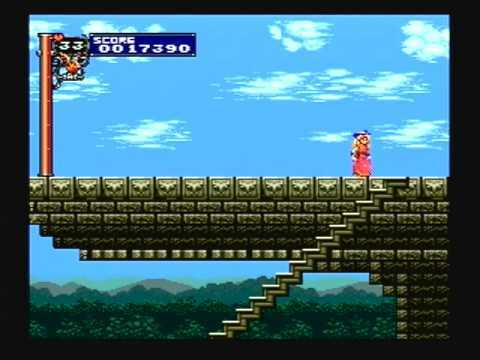 If handling is similar to Castlevania I would immediately know I need to press down to use the stairs; not so much if it handled like Super Mario World or Sonic, for example, where you are just expected to move fast so environmental awareness works differently. I think B could work as a Castlevania-style approach even if we don't "close" the top of the stairs, simply by making the floor in that part look like a pseudo-background (I hope I'm explaining it clearly enough) or by making it thinner than the rest of the floor (giving it a one-way platform look), as a visual cue that the player can stand on it. Or... and here is my Option D, the visual cue could be that the gap is smaller than the player's width, so visually it feels that you can walk over it, but at the same time this leaves the stairs alone and the visual path from the top right to the stairs is uninterrupted, no need to "close" it either visually or functionally. I kind of preferred B. Sort of how sega did micheal Jackson stairs. To me it’s intuitive that you press down or diagonal to go down stairs. Left or right will bypass the stairs. Option B is great when done well. I would go with option A. I don't know if that would be a right solution for your project but, being a big fan of N Game, I like intuitive and simple designs in platformers. 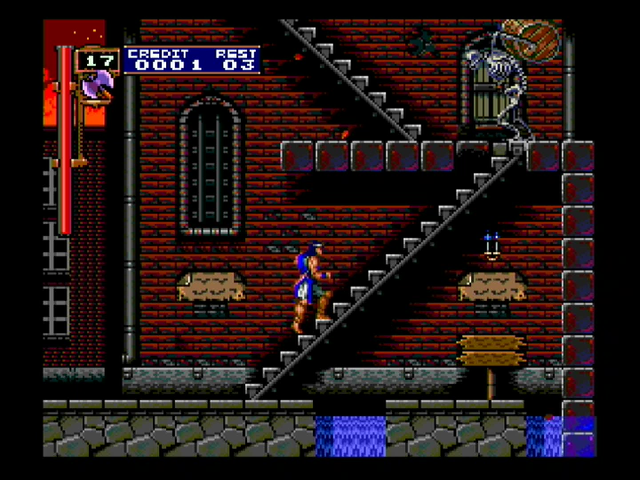 Classic Castlevania games do your option B a lot. Notice how the stairs still go through a visible floor. That portion of the floor is drawn in such a way that it looks as if it was behind the stairs, so it doesn't look weird when the player walks through it, and also allows them to stand without floating awkwardly in place. So yeah, I'd go for option B, but make sure there's a background that logically explains why the player can stand there, but still go through. You can also just imply that the stairs are on the foreground instead. Both these screenshots are from Rondo of Blood, it uses both methods depending on the location. Functionally though, it's always option B.